The use of CAD programs makes it much easier for us to develop new parts, since possible problems with a new product can be detected and eliminated at an early stage. Since not everything can always be measured 100% on the bike, it is not possible to mount every part digitally on the bike and then produce it exactly as it is. Here prototypes must be manufactured, into which then usually still small corrections must flow. Here comes now recently another Gadget to the Thunderbike prototype development into the play: The 3D printer! With its help, our CAD drawings can be quickly converted into a bolt-on product. The result of the printing consists of PLA, a plastic which is formed layer by layer into our prototype. Later recesses (e.g. for turn signal inserts) are filled with a further plastic, PVA, which dissolves in the water and thus releases the recess. The printed prototypes can thus be adapted and corrected relatively easily without having to interrupt the production processes of our milling machines during the prototype phase. 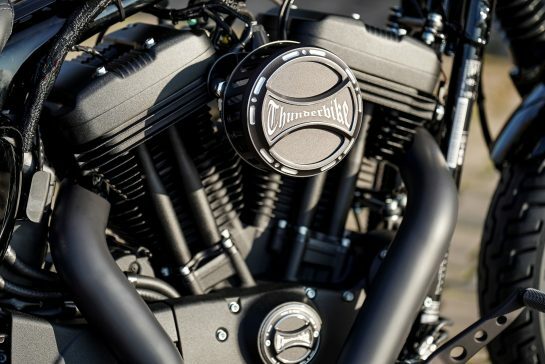 This allows us to quickly develop custom-fit accessories for your Harley. You can find many examples and inspirations in our Custombikes category. Information about parts like Wheels & Rims, License Plates, Rear Fenders and much more can be found in the Parts category. Would you like to become part of our product development and production? Then apply now!